According to A. Physicist, Brown Dwarf stars are electric bodies surrounded by a cloud of gas, so let’s start with that. In astronomy (like any other science) definitions matter. They need to be precise, we have to agree to use the same definitions so that we can be clear about what the research says. Anyone who uses a different definition is either confused about the terminology of the field, or is intentionally misusing the terminology. This is a huge red flag from the get go, because it’s not how astronomers define brown dwarfs. The general definition for a brown dwarf is that it’s an object that is more massive than a planet, but less massive than a star. A star is defined as a body that is massive enough to fuse hydrogen in its core. This means a star has to be about 80 times more massive than Jupiter. The upper cutoff for a planet is that it isn’t massive enough for any nuclear fusion to occur in its interior. At about 13 times the mass of Jupiter, objects become just massive enough to fuse deuterium to create a bit of heat, so we can say a brown dwarf is basically any object that has a mass between 13 and 80 times that of Jupiter. 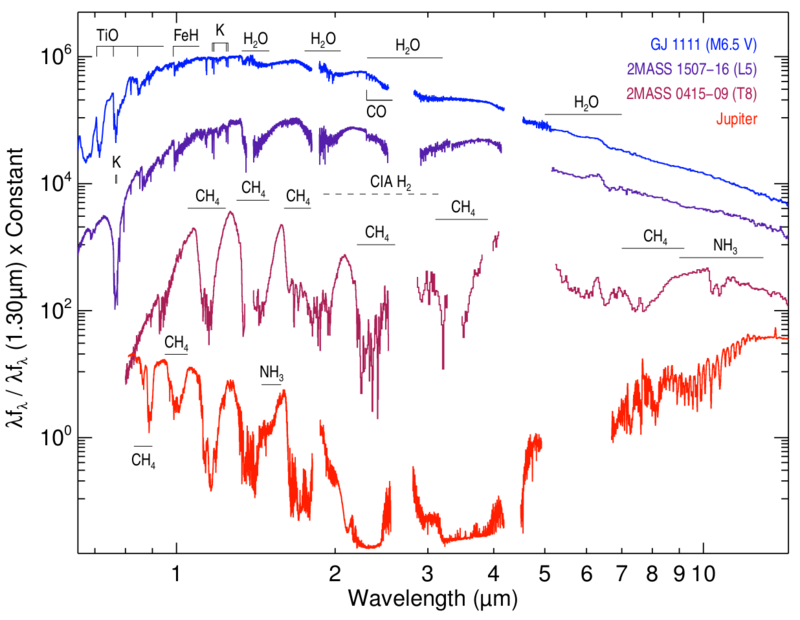 Observationally we can distinguish brown dwarfs by their spectral class. That is, when we look at the light coming from an object, there is a specific wavelength (color) which is the brightest. This peak color determines the spectral class, and it’s also a good measure of an object’s surface temperature. The longer the wavelength (the more red) the peak color, the cooler the object. The smallest stars, known as red dwarfs are M-class stars, and have a surface temperature of about 2,800 K, which is about half the temperature of the Sun’s surface. Brown dwarfs are L-class or T-class stars, and can have temperatures as high as 2,000 K or as low as 700 K. Since brown dwarfs don’t produce much heat by nuclear fusion, they gradually cool down as they age. By comparison, Jupiter (which even A. Physicist would admit is a planet) has a surface temperature of about 180 K.
The spectrum of Eris. 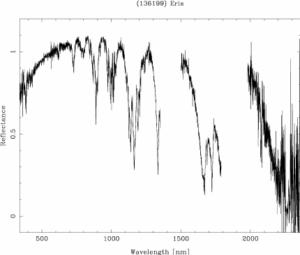 Notice it doesn’t look like a brown dwarf spectrum. Credit: Alvarez-Candal, et al. Although we don’t categorize planets by spectral type, we can look at the spectrum of light from planet-like bodies to determine their surface temperature. 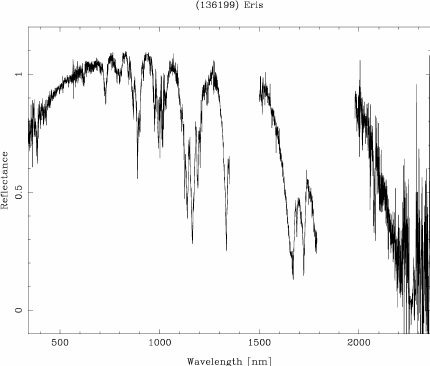 Astronomers have done this with the spectrum of Eris, so we know its surface temperature is much cooler, about 50 K. So Eris is far too cold to be a brown dwarf, and isn’t the right spectral type. So by the accepted definition (the ones astronomers use) Eris is not a brown dwarf. Now A. Physicist might argue that since Eris is electric and surrounded by gas (it’s not, but we’ll let that slide for now) and such, the spectrum can’t be trusted. There are actually limitations to spectral class. For example, small red dwarf stars have the same surface temperatures as red giant stars, so we can’t always assume that an M-class star is small. We also have to look at other evidence. Fortunately Eris has a moon known as Dysnomia, and that means we can calculate the mass of Eris using good ol’ Newtonian gravity. The orbit of Dysnomia around Eris, and observed by the Hubble and Keck telescopes. Note how well the data (open circles) matches the calculated orbit. The planets orbit the Sun because the Sun’s gravity pulls on them. As Newton demonstrated, this is due to the mutual attraction between their masses. It turns out that the orbit of a planet around a star, or a moon around a planet depend upon their masses and how far apart they are. So if you watch one object orbit another, you can calculate the mass of each object. The math is pretty easy (it’s a calculation I have my introductory astronomy students do). By watching Dysnomia orbit Eris, we know exactly how massive each of them are. It turns out Eris has a mass of (1.66±0.02)×1022 kg, or about a fourth the mass of the Moon. 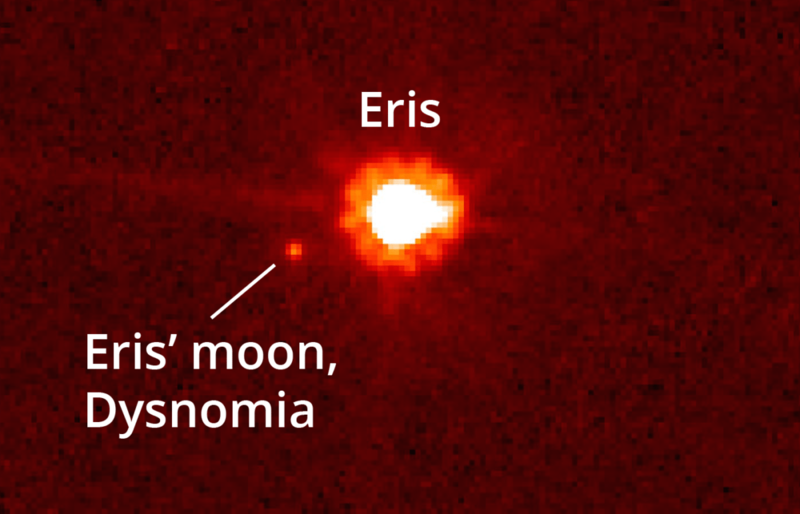 The Moon is warmer than Eris, and is four times more massive than Eris, and it is not a brown dwarf. Eris is a small, icy world, and wae know that definitively. So let’s go back to the claim of A. Physicist that Eris is an electric body surrounded by a cloud of gas. The electric part is based on the electric universe model, which I’ve debunked before. But the key part of the argument is that Eris seems to be surrounded by an irregularly shaped cloud of gas, as seen in the image above. This is an excellent example of how images can be used to promote pseudoscientific ideas. A. Physicist doesn’t provide a source for these images (a big no-no in science), but a Google search confirms that they are images taken by the Keck telescope in Hawaii. The Keck observatory is a ground-based telescope consisting of two 10-meter mirrors. Although Keck is on Mauna Kea at an elevation of 13,600 ft, it still has to contend with atmospheric distortions. What looks like a cloudy blur is actually due to the fact that our atmosphere blurs it a bit. The image is also a bit over exposed, so that you can see Dysnomia. The purpose of the image was to track the position of Dysnomia over time to calculate its orbit, so the blurriness isn’t a problem for astronomers. A Hubble image of Pluto and Charon, which has a similar “fuzzy cloud” around them. 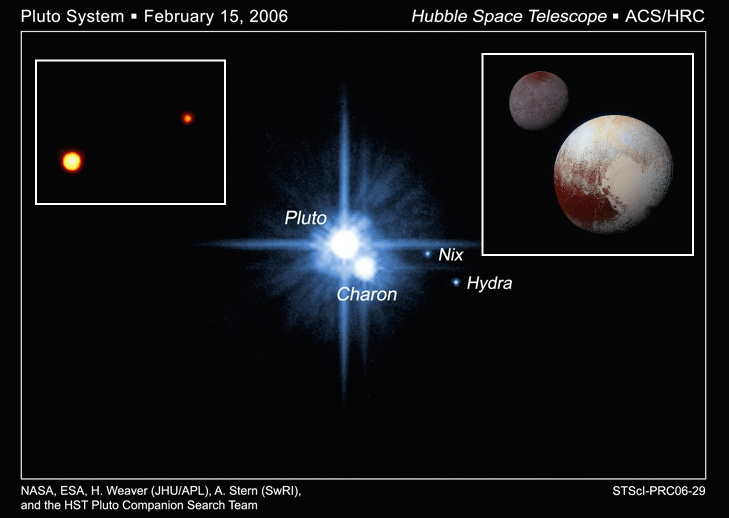 The image is actually over exposed in order to see Pluto’s smaller moons, Nix and Hydra. The inset upper left is a Hubble image of Pluto and Charon that is not over exposed. The inset upper right shows Pluto and Charon as seen by the New Horizon spacecraft. Notice there is no thick cloud surrounding them. You can see a similar effect with a Hubble image of Pluto, where they are over exposed in order to see Pluto’s smaller moons Nix and Hydra. This doesn’t mean Pluto is surrounded by a cloud of gas. As you can see in the image above, a similar Hubble view of Pluto and Charon doesn’t have that effect, and when the New Horizons spacecraft flew past Pluto, it captured images of an icy planetary surface, with no thick cloud surrounding it. 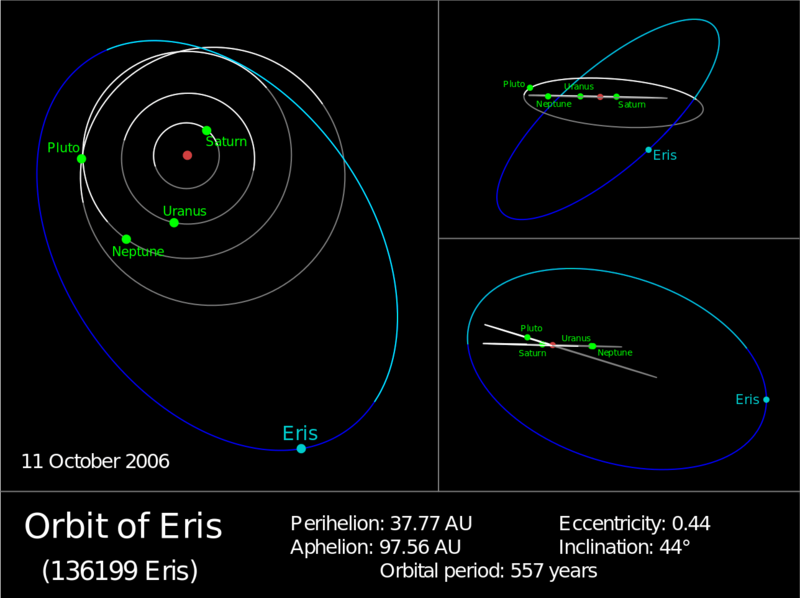 Like Pluto, Eris might have a thin atmosphere, but that’s about it. Now that we’ve established that Eris is a small, cold, moon-like world, let’s look at the last claim that Eris could be heading toward Earth. The basic claim of A. Physicist is that astronomers may have the orbit wrong because they think Eris is small instead of being a large brown dwarf. It’s a nonsensical argument because the orbit of Eris is calculated by its apparent motion, not its apparent size. Eris can be observed moving relative to distant background stars. Its apparent position depends upon the location of Eris and the location of Earth, so we can calculate not only its motion, but its distance. This allows us to calculate the orbit of Eris. And these calculations only depend upon observed position, not size. We can calculate Jupiter’s orbit the same way. We know beyond a shadow of a doubt that Eris is well beyond the orbit of Neptune, and will never come close to Earth. Take it from an astrophysicist. Eris is not a brown dwarf. It is a small, icy world in the outer solar system, and poses no threat to Earth. You made that EU post 3 years ago and you’re STILL getting comments about it? It looks like you’ve got more comments on that one article than on the entire site. What is it with these theories? It’s like homeopathy, it turns people into evangelists. I think the problem is that while there are only a tiny number of EU people, they are obsessive (in some way that probably has a proper psychological sense), and such people will *never* give up. And, sadly, really tiny numbers of people who never give up are quite capable of hopelessly & terminally derailing conversations especially now that search engines let anyone do what Kibo did. Yes, it remains my most popular post by far. I think for the average person they simply cannot grasp how vast, old, and complex (yet simple in aspects) the physical universe is. Whereas we embrace it, for many people it is really, really scary. They feel even smaller and more helpless. Instead of embracing it and the joy of exploring nature in its entirely, they embrace anything that relieves them of this overwhelming fear, even just a little bit – like feeling they are part of some secret that gives them the (false) feeling of a tiny bit of power over their reality again. Wow! Such a scary and egotistical comment. Perhaps we should leave running the world up to people like you who understand it. Here’s one for the therapist. Q. How long does it take a psychiatrist to change a light bulb? A. It takes seven years, and the light bulb has to want to change. Good post Brian. What scares me is that we seem to be contending more and more with this kind of quackery with each passing day. Anti vaxxers , David “Avocado” Wolf and a string of others just seem to be hitting it out of the park these days. A growing mistrust of authority seems to be directing itself more and more towards science. Just keep on being sane and putting out these cool posts. This is awesome. Hopefully a few people will have less anxiety, thanks to you! Thank you so much for this! You have no idea how elated I am. I have said it time and time again, we have been here for millions of years, my father has said when Nibiru was discovered when he was in school they also had the bomb drills for the fact a planet like object would pass Earth and bring astroids from the astroid belt. Now he is 66 and the man doesn’t have Facebook, email accounts, he still has a flip phone has no ties to social media and reads national geographic. However, just recently he has said something even that made my hair’s stand up. Said Alex the sky it is changing more and more I feel that the school drills I tell you kids about that were due to Nibiru maybe they were right, we have more questions than answers with NASA and the Astroids coming out of no where. He is healthy and even I noticed the skies are changing, I have done a lot of research, what I have found is when I knew we were in a binary system I was told I was crazy.. I am photographer and I have family in the Navy who actually said I am not sure what you have Alex, I clearly can’t seem to keep explaining the weather the same way it has changed for many reasons but non have sticked. History shows this happened before, and Ancient Records show our system has a lonely object that does pass Earth it does not hit Earth. If you have traveled around the world their are tribes that speak of this in their stories passed down. Rather people have lost their mind or not something is coming it had been on News Channels with NASA Specialist called Planet 9 it’s a blue gas giant. They have said the numbers never added up and now the Vatican has spent millions of the Lucifer project. That telescope is made to look for these objects. Due to the actual records u can get in museums about the Anunnaki can you explain to me when I asked all Scientist how can you say the first man gave us reading and writing yet call this planet a myth yet they were the first to write? Wow! Who would’ve thought that you as an astrophysicist would have to help out with phobia patients one day.